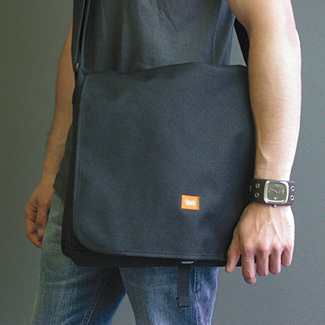 R.E.Load has a very cool miniature messenger bag measuring 7″ wide x 6″ tall. What are tiny messenger bags for, you ask? Tiny messenger bags are for things that are tiny. Like text books (on your PDA) , blackberries, wallets, or a large cell phone. OR, for a tiny person like my toddler. Then this bag is for normal sized objects like a doll, sippy-cups, fruit snacks for dad, that sort of thing. We take your order, cut out your materials, and sew everything together with our own two hands. Then we check and double-check every stitch, pack up your bag and ride it to our shippers. This bag is aimed at the Geek in you, and or at least it seems that way from Fractal Spin’s product description. If the high voltage strap isn’t a dead give away, then the mention of the O’Reilly guides really makes the geek in me scream “I WANT THIS”. This bag is a great find. Perfect for keeping your stowed items warm in the upcoming cold months. Made from recycled Swiss Army stuff.